You can reduce or enlarge the size of your image as you scan. You can also select a specific scan size, such as a common photo size like 4 × 6 inches (102 × 152 mm). This places a scan area of that size on the preview image so you can use it to help crop the image in the correct proportions. Click the Preview button to preview your image. 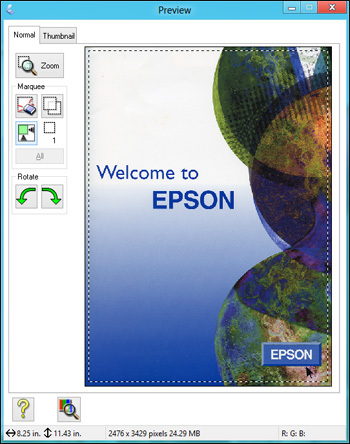 In the Epson Scan window, select the size you want your scanned image to be from the Target Size list. Note: If you need to rotate the orientation of the target size for your image, click the orientation icon. A marquee (dotted line) appears on your preview image proportioned for the size you selected. To move the marquee, click inside the scan area and drag the marquee where you want it. To resize the scan area, place your cursor over the edge or corner of the marquee, then click and drag the edge where you want it. Note: Manually adjusting the marquee will not change the target size of the scanned file. The marquee only indicates the area of the image that will be scanned. 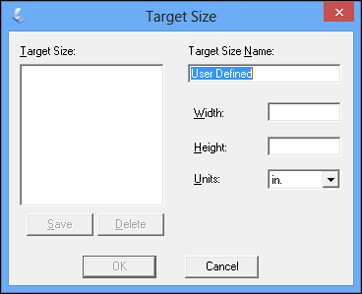 To create a scanned image size that is not available in the Target Size list, click the Customize option. Name the custom size, enter the size, click Save, and click OK. Then create a scan area on the preview image. The marquee is automatically proportioned for your custom scan size. To use additional sizing tools, click the + (Windows) or (OS X) icon next to the Target Size setting and select options as desired. Scale: Reduces or enlarges your image by the percentage you enter. Trimming: Turns automatic image cropping on or off. Unlock icon: Unlocks the width/height proportions of the scanned image size so you can adjust it without constraint.